I hope you don’t think I’m like some pesky neighbor knocking on your door a little too frequent with the more than usual posts. Hope you don’t mind because I have so many fall recipes to share with you! 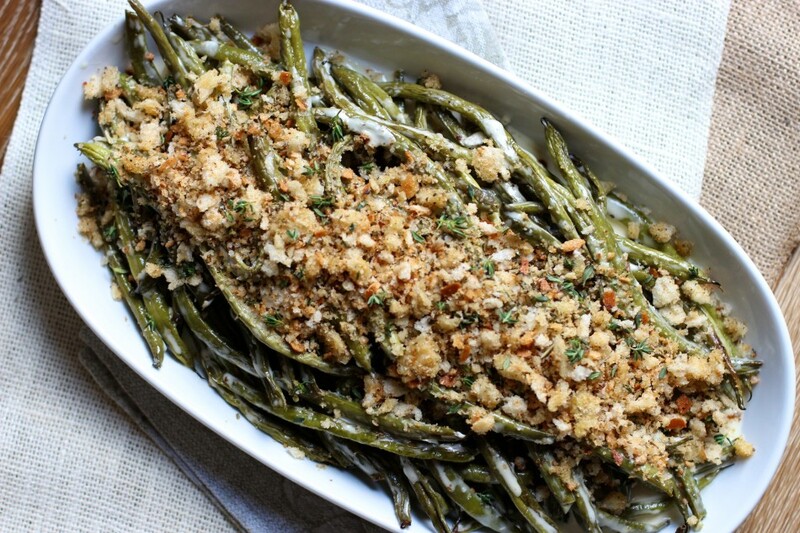 Here’s my twist on the classic green bean casserole for Thanksgiving. 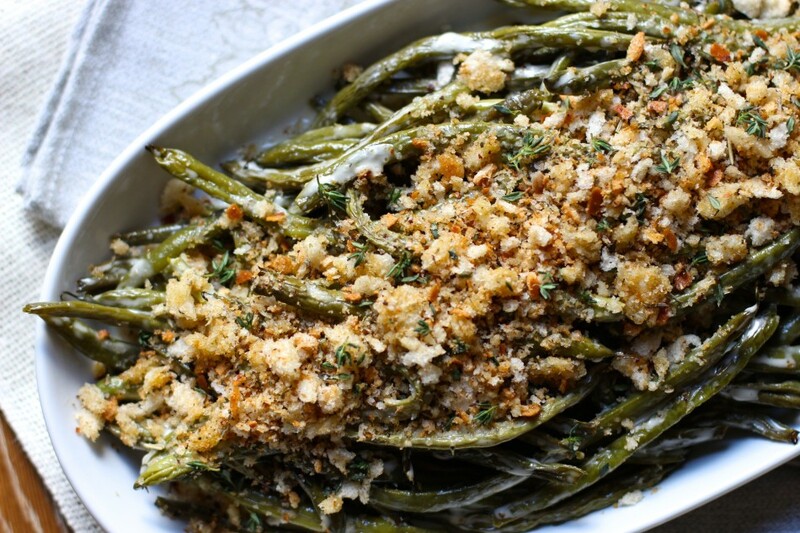 Well, maybe a lot of a twist on the classic green bean casserole but my goodness is this GOOD. I will make it short and just get right down to it. 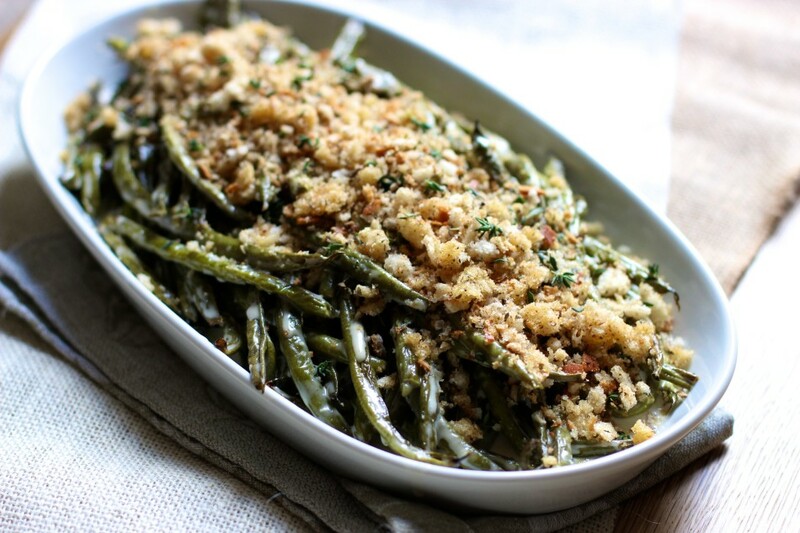 The green beans have those crisp brown edges that make you wanna eat them all, a little cream and lots of crisp breadcrumbs on top to catch in every bite. 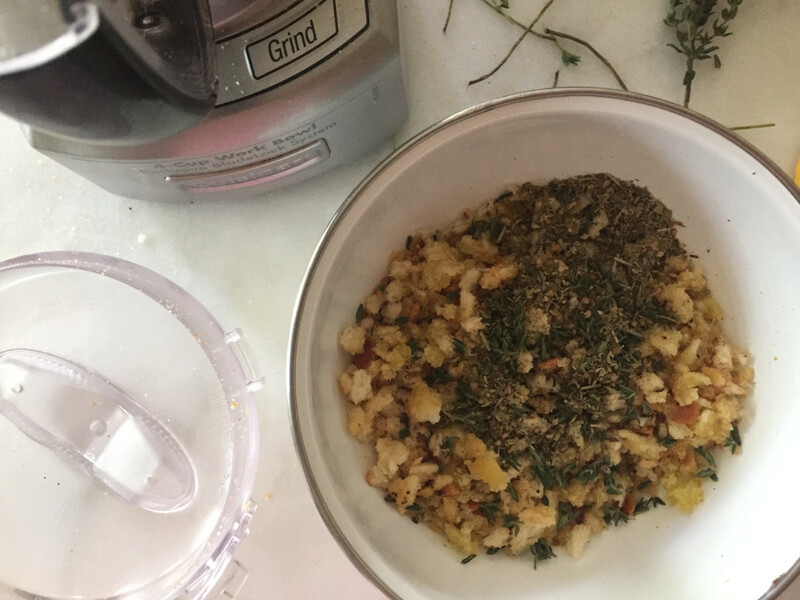 I drizzled lemon vinaigrette for a lighter, more refreshing side dish, then added a good heaping of crisp herbed breadcrumbs on top and I must tell you it was scrumptious without feeling heavy. So easy and ready in 30 minutes. This one is a keeper! Not really anything like a green bean casserole but worth the venture out to new pastures. Give it a try and let me know what you think. P.S.- Before I go and speaking of new, I have a new brussels sprouts recipe coming real soon! 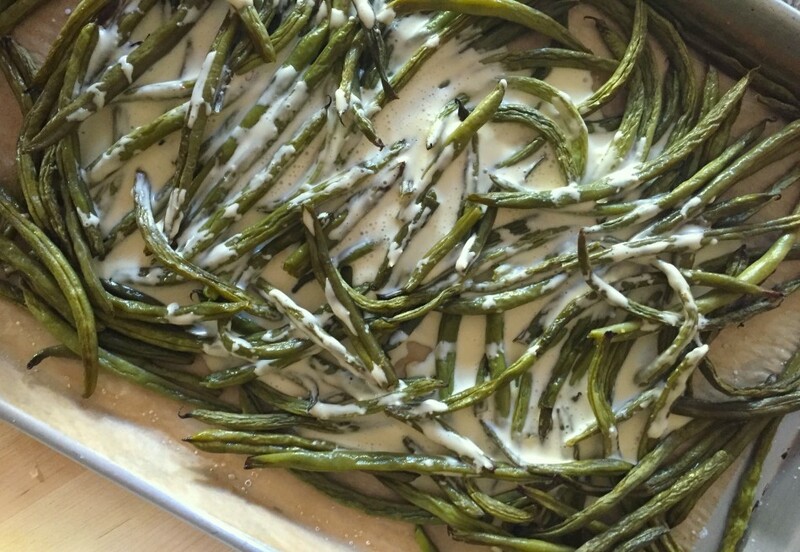 Divide trimmed green beans between the two baking sheets, spread out into a single layer. Add olive oil, kosher salt and pepper. Bake for 25-30 minutes. It should look lightly browned with somewhat crisp edges, yet tender on the inside of the beans. Note: If freezing to make ahead, add olive oil, salt and pepper after thawed and before reheating at 300 degrees F for 15-20 minutes. If freezing after combining with vinaigrette then season and oil beforehand. Drizzle vinaigrette on green beans (I combine green beans from both sheets into one) and toss to combine then transfer to your serving dish. 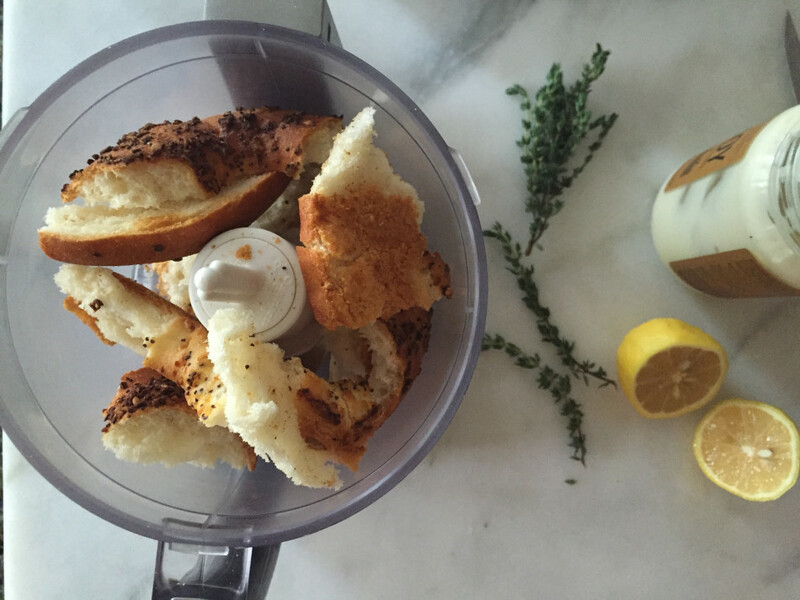 Sprinkle on bread crumbs, and extra thyme leaves for garnish and serve. 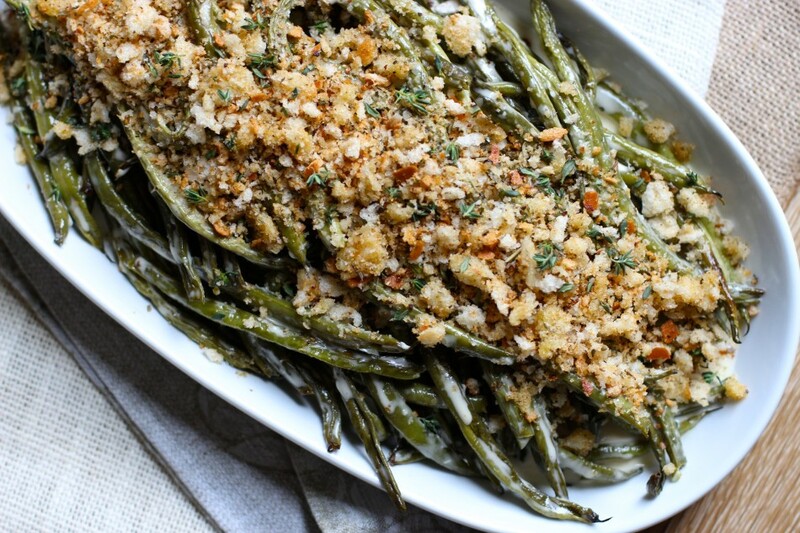 Make ahead: Green beans are freezer friendly when tossed in the vinaigrette only. Thaw at room temperature, then reheat at 300 degrees F (148 Celsius) for 15-20 minutes before adding breadcrumbs. Prepared breadcrumbs can be frozen separately (in a freezer safe container) then assemble before serving. 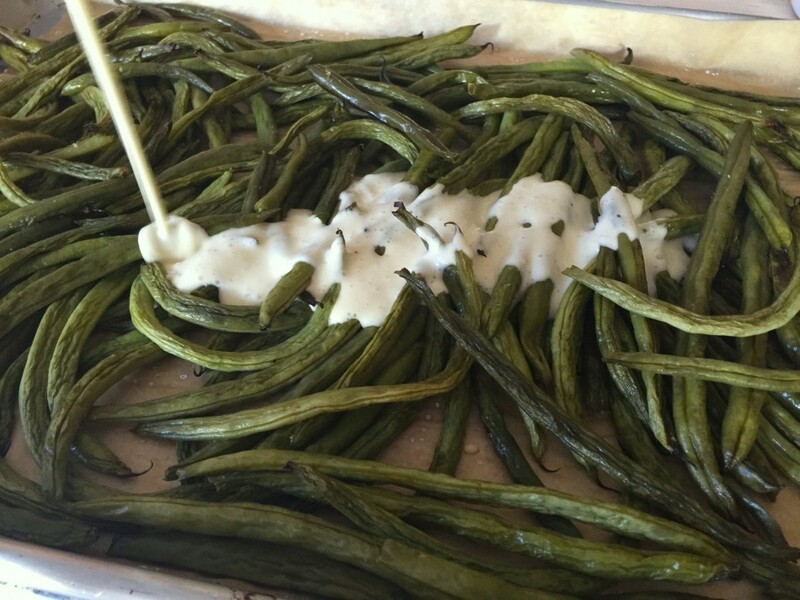 What a creative way to take a simple string bean and turn it into a special compliment to any meal. Can't wait to make this. Why would you rate a recipe on how much you "liked it" if you have not made it and tasted it? This creates false review scores for others reading the recipe and genuinely interested in what others think of the recipe after making it and tasting it. Rating is to rate how you liked a recipe, yes...though it is not up to me if someone "rates" a recipe before trying it since it is an open forum. Hope that clears things up. I never liked green bean casserole. This looks delicious and love Canyon Bakehouse bagels. Think it's pretty cool how you make gluten and dairy free recipes that look and sound delicious. I like your twist on green bean casserole. The thought of mushroom soup mix with green beans was never my thing. This looks really good and I think I will be giving it a try. Never too many Thanksgiving recipes thank you!! Mmmm, I like the sound of this a lot. Nice take on green beans and clever use of bagel! Your recipe just may replace my green bean casserole. I found a gluten and dairy free a few years back but nobody in my family really likes it. I plan to put bread cubes in my stuffing and I'm concerned that along with breadcrumbs on my green beans it may be too much bread. Do you think this would be good if I subbed breadcrumbs for toasted pecans? I use the fried shallots from the Asian market. They are simple shallots fried in oil, no breading. They are clean and crispy tasting. You can do it yourself, but it's so much easier to get there! Oooo! YES! Another delicious recipe to add to my Thanksgiving menu :) I looooove that this is quick, too. YUM!! Could you use panko crumbs instead of the bagel??? I don't see why not, sure. I believe it would be between 1 1/2 to 2 cups of panko needed to sub the bagel. Aw, thanks SO much Mackenzie! You must try it, and a nice dish any time of the year. Has anyone made this yet? I'd like to try it but I'd like to hear a few takes on making it. Thanks in advance. Thanks for the reply on the panko! Gonna try it. Did you roast the green beans "dry"?? The recipe doesn't say use oil or anything - they just seemed "dry." Love the fact this is a "freezer friendly" recipe - makes life so much easier! 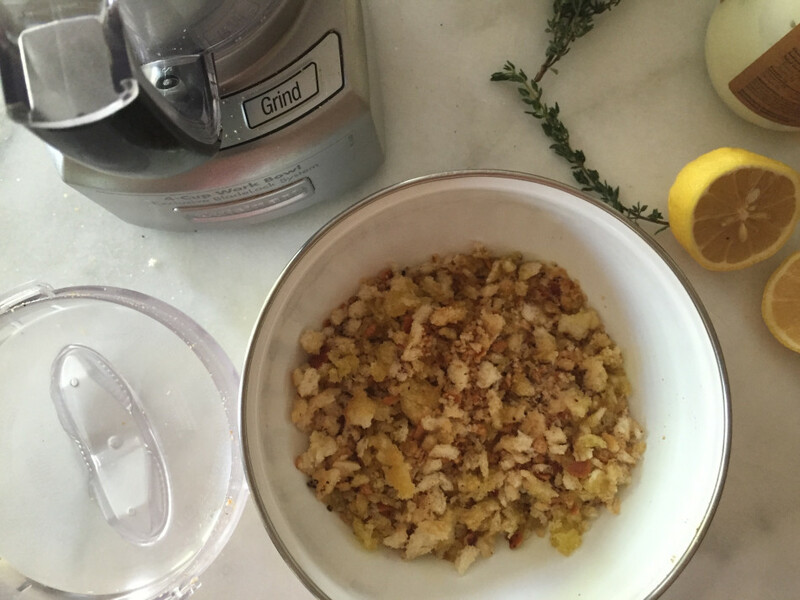 When you freeze the breadcrumbs, have you already put the oil in? My beans are in the freezer and the vinaigrette is quite tasty! Oops, I will note that! You can freeze the green beans dry, then drizzle about a tablespoon of olive oil with a dash of salt and pepper before reheating at 300 degrees F. Either way is fine. Yes, freeze breadcrumb with oil and reheat in the same oven (separately) with the green beans. I will clarify this on the post, thank you for pointing it out. :) It is! Also nice as a salad dressing...enjoy! Oops! I roasted them "dry" and then put the vinaigrette on them per your note: Green beans are freezer friendly when tossed in the vinaigrette only. Assume they'll be ok???? I did 5 lbs - I'd hate to have to start over! Thanks you SO much for all your help! Am "noting" these things on my recipe! Nice twist on the traditional! How much sliced bread should I use? I don't have any bagels on hand and want to make this tomorrow. Thanks! Made the aoili and the breadcrumbs and wanted to comment that both are so good! Think I'm going to be making the aoili as salad dressing too! :) Thanks. Thanks so much Ricki! Enjoy!! I have made this a few times already, tonight with apricot glazed pork chops. Amazing every time! Trying new recipes for Thanksgiving including this for dinner tonight with roast chicken and it turned out delicious! I love the lemon flavor in the aoli and all the different textures, thanks for a new tasty side dish! I made this for dinner tonight to test out as a possible Thanksgiving side dish and we all thought it was delicious! My only thing is I think I'm going to put less lemon for Thanksgiving knowing that my family may say it's too lemony but we love it. Great recipe!